Chelsea midfielder John Mikel Obi is still available for Nigeria duty despite not being involved since November, according to the player's representative John Shittu. New Nigeria coach Sunday Oliseh said he omitted Mikel from his first squad because the player was uncontactable. However, Shittu told BBC Sport: "Mikel will never turn his back on Nigeria. "He loves playing for his country and this is just a miscommunication between coach and player." On Thursday, Oliseh explained to local media in Abuja why Mikel was not part of his plans for next month's 2017 Africa Cup of Nations qualifier in Tanzania . "I was in England early this month and I put a call through to Mikel. I called him four times, the phone kept ringing. I sent him a text message, I got no response," Oliseh revealed. "I called his Chelsea team-mate and compatriot [Victor] Moses and we met after the Community Shield. 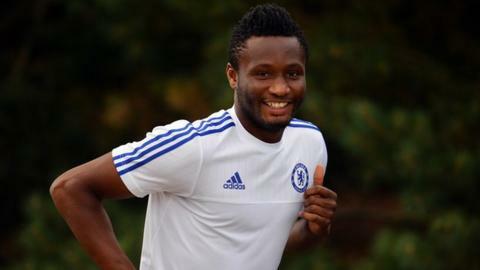 "I didn't hear from Mikel to acknowledge my calls or text until I travelled back home [on 6 August]. "But after our training [on 19 August] I saw a missed call [from Mikel] on my phone so at the moment I really don't know what the situation is now." Shittu insists Mikel has not been deliberately evasive. "Mikel sincerely missed the calls and wasn't sure who called. Once he realised who it was he made efforts to reach Sunday Oliseh but could not speak to him." he said. "It's unfortunate that a miscommunication is being blown out of proportion in the media. "Efforts are being made to sort things out amicably because Mikel is dedicated to Nigeria. "For the sake of the country, everyone should support the coach and the players selected instead of focussing on other things that could affect the preparation." Oliseh's predecessors Berti Vogts, Samson Siasia and Stephen Keshi also experienced difficulties with Mikel, who has been criticised for appearing to show indifference and a lack of respect. Mikel, who made his debut for Nigeria against Libya in August 2005, has scored four goals for his country in 64 appearances.